The USGA has announced the six players who will represent the USA in the 2018 World Amateur Team Championships at Carton House. The world numbers one, two and three — Jennifer Kupcho (21), Lilia Vu (20) and Kristen Gillman (20), — will play in the Espirito Santo Trophy from August 29 to September 1 with Cole Hammer, (18), Collin Morikawa (21) and Justin Suh (21) teeing it up in the Eisenhower Trophy from September 5-8. World No 1 Braden Thornberry plans to head to the PGA Tour Q-School and turn professional if he gets his card. "We are thrilled that this group will represent the United States during this international competition," said Mark Newell, president of the USGA. "The World Amateur Team Championships carry such a rich competitive history, and these six golfers will undoubtedly represent our organization and our country as talented competitors and worthy ambassadors of the game." The World Amateur Team Championships are conducted by the International Golf Federation (IGF). The IGF also conducts the golf competitions in the Olympic Games and Youth Olympic Games. Gillman, a rising junior at the University of Alabama, is coming off her second U.S. Women’s Amateur Championship win, defeating incoming teammate Jiwon Jeon, 7 and 6, at the Golf Club of Tennessee earlier this month. Gillman, who is currently No. 3 in the Women’s World Amateur Golf Ranking™ (WAGR), was a member of this summer’s victorious USA Curtis Cup Team. Kupcho, a rising senior at Wake Forest University, was recently awarded the 2018 Mark H. McCormack Medal, given annually by the USGA and The R&A to the leading female amateur. She is currently No. 1 in the WAGR, and has spent five weeks in the top position this year. Kupcho, also a member of the 2018 USA Curtis Cup Team, won the 2018 NCAA Division I individual championship en route to five individual collegiate wins in her junior season. In addition, she set the school record with a 70.6 scoring average this year. Vu, a rising senior at UCLA, is No. 2 in the WAGR after spending 19 weeks at No. 1 over the past year, including 18 consecutive weeks beginning in March. A member of the victorious 2018 USA Curtis Cup Team, Vu finished third in this summer’s Canadian Women’s Amateur Championship, as well as third in the Southern California Women’s Amateur Championship. Her junior season also featured four individual collegiate titles. Stasia Collins, past chairman of the USGA Women’s Committee, will serve as captain of the USA Women’s World Amateur Team. Jennifer Kupcho. Credit The R&A/Getty Images. "I an honoured to have the opportunity to serve as captain to these outstanding players," said Collins. "These three women are not only incredibly talented and seasoned competitors, but they are also wonderful individuals who will represent our country tremendously well." Hammer, who made it to the semifinals of the U.S. 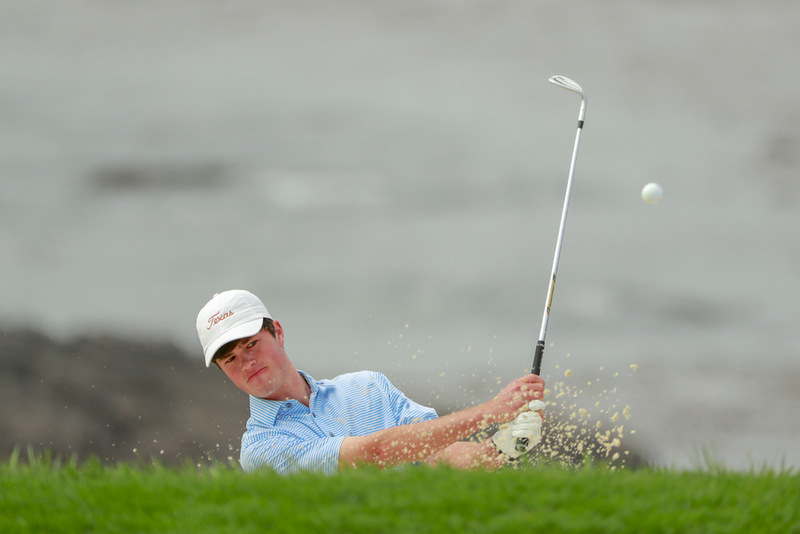 Amateur Championship this week at Pebble Beach Golf Links, is an incoming freshman at the University of Texas. Currently No. 17 in the WAGR, Hammer had an incredibly successful summer, winning the 2018 Western Amateur as well as advancing to the semifinals of the U.S. Junior Amateur Championship. In the spring, he won the Azalea Invitational, as well as the U.S. Amateur Four-Ball Championship with partner Garrett Barber. Morikawa, a senior at University of California, Berkeley, is coming off a junior season in which he won two collegiate individual titles and earned 11 Top-20 finishes en route to claiming First Team All-American honours. Currently No. 3 in the WAGR, Morikawa made the cut in the PGA Tour’s Arnold Palmer Invitational in March. Suh, a junior at USC, has competed in eight USGA championships and advanced to match play in three consecutive U.S. Amateurs. In 2018, Suh was chosen Pac-12 Conference Player of the Year, captured the Pac-12 Championship and established USC’s single-season records for stroke average (68.73) and rounds in the 60s (21). He is currently No. 2 in the WAGR, and in June won the Northeast Amateur. Earlier this summer, the USGA announced a series of revisions to the association’s selection process for international teams that provide for some automatic selections, as well as creating more transparency into how the remaining selections are made. The selection process now automatically names the best-ranked USA players in the WAGR as of pre-determined dates (Kupcho/Suh) as well as an American U.S. Women’s Amateur (Gillman) and U.S. Amateur champion. The selections of Hammer, Morikawa and Vu were decided by the USGA’s International Team Selection Committee. The World Amateur Team Championship was founded in 1958, and the Women’s World Amateur Team Championship began in 1964. The IGF was founded in 1958 to encourage the international development of golf through friendship and sportsmanship. Today, the IGF consists of 151 national governing bodies of golf representing 146 countries and is the international federation for golf for the International Olympic Committee. The Irish Ladies Golf Union and the Golfing Union of Ireland will host the 2018 World Amateur Team Championships. The championship was last played in 2016 in Riviera Maya, Mexico, with the team from The Republic of Korea taking the title on the women’s side and Australia winning the men’s championship. The USA last won the women’s championship in 1998 and has captured the Espirito Santo Trophy a record 13 times, while the USA won the men’s championship in 2014 and has captured the Eisenhower Trophy a record 15 times. The 2020 championship will be hosted by the Hong Kong Golf Association and contested at Hong Kong Golf Club (Old and New Courses). Ireland to host 2018 World Amateur Team Championships - Who can match McGimpsey, O'Connell and Gribben? Three Irishmen have lifted the Eisenhower Trophy with GB&I while no Irish women have yet managed to win the Espirito Santo Trophy. In 2018 six top Irish players will have the chance to make history when Ireland hosts the World Amateur Team Championships for the first time.